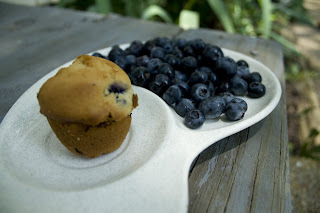 Now that blueberries are in season thought I'd share with you my favorite recipe for a basic blueberry muffin. This recipe will make 12 regular size muffins or 24 mini muffins. Coat muffin tin with vegetable oil or butter. In a large bowl combine everything except the blueberries until it is no longer lumpy. Gently fold the berries into the batter and stir. Fill each cup 3/4 full. Bake for 17-20 minutes or until a toothpick inserted into the center of a muffin comes out clean. Transfer to a wire rack to cool for 10 minutes.